Finally a light bulb made just for garage door operators! Standard LED light bulbs can create significant interference between your remote and the garage door opener. Genie's LED light bulb minimizes this interference. The bulb is also designed to be vibration resistant and to withstand 5G force testing. The bulb is also built for damp locations and cold weather tested to -22F. 1. Will the Genie LED light bulb prevent or greatly reduce the interference common LED and CFL bulbs can cause my opener's remote? Yes! The Genie LED light bulb is radio frequency friendly - specifically designed to reduce or eliminate radio frequency interference with your opener's remote so that it can operate at its proper range! 2. How bright is the light bulb? 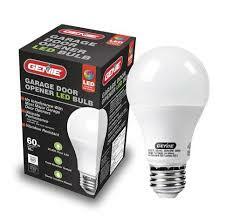 The Genie LED light bulb is rated equivalent to a 60 watt incandescent bulb in terms of brightness (800 lumens). 3. What is the power usage of this light bulb? The Genie LED light bulb uses only 10 watts of power, which equals a very low cost per year. 4. Is this bulb durable? The Genie LED light bulb is shatter and vibration resistant. Testing has shown it to be able to withstand 5G of shaking force, far more than normal vibration from opener rail and drive systems. This bulb has been cold weather tested to -30 C (-22 F) and is damp location rated, so it can withstand the toughest conditions! 5. How long will this bulb last? The Genie LED light bulb has been tested to last 25,000 hours under normal operating conditions. 6. My current opener is not a Genie. Will this bulb still work with it? Yes! The Genie LED light bulb works with almost any brand of opener to effectively reduce or eliminate radio frequency interference with your remote.